By combining the LS materials testing machine with the NEXYGENPlus software and the grip that matches your sample, test type and the international standard requirements within your field, you get a powerful, high-precision, and highly specialized materials testing system that can perform a wide range of test types on materials such as plastic, rubber, electronics, textiles, wood, packaging, medical devices and cosmetics. The LS materials testing machines from Lloyd Instruments are easy-to-use universal testing machines ideal for materials testing up to 5 kN (1124 lbf). The machines use high-accuracy interchangeable YLC Series load cells for tension, compression and cycling through zero-force measurements, and they have an accuracy of ±0.5% from 1% to 100% of load cell value. The LS Series have a large working area and come in three sizes and capacities: the LS1 (up to 1 kN/225 lbf), the LS2.5 (up to 2.5 kN/562 lbf) and the LS5 (5kN/1124 lbf). These materials testing machines feature an integral control console with a multi-function keyboard and easy-to-read backlit LCD to display load and extension information. The control console displays prompts and menus, which guide the user through machine operations. With the interchangeable grips and the wide range of test types in the NEXYGENPlus software, the LS materials testing machines are ideal for product development, production testing, and quality control. 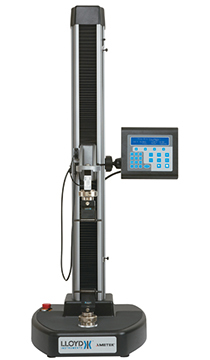 Find the Declaration of Conformity for the LS Series materials test machine here. Firmware Version 2.1 Issue 1 15-Sep-14. Improved the load filter values to be more responsive.